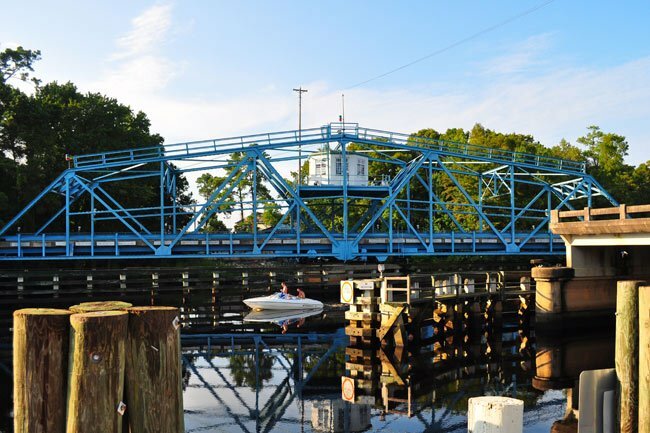 This swing bridge, located in the historic community of Socastee, pivots by demand at quarter-to and quarter-past the hour. 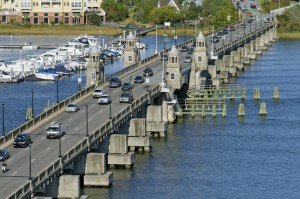 Built in 1935, it crosses the Intracoastal Waterway and helps connect the county seat of Conway with nearby Myrtle Beach. 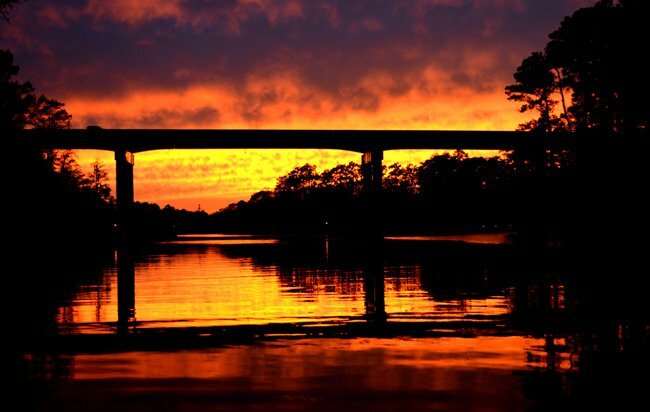 Completed in 1936, Horry County’s section of the Intracoastal Waterway holds special importance. 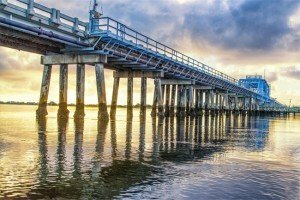 After more than a century, it formed the final leg in this 2,700-mile route, which runs along the Eastern Seaboard from Maine to Florida and provides safe, non-oceanic navigation for boats and ships. 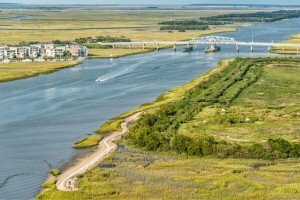 The Intracoastal Waterway got its official start with the General Survey Act of 1824, though George Washington himself is said to have dreamed of such a route. Interestingly, the leg that runs from Little River to Socastee Creek also holds the distinction of being the “longest man-made ditch in the entire length of the Intracoastal Waterway” (Horry County Historical Society). 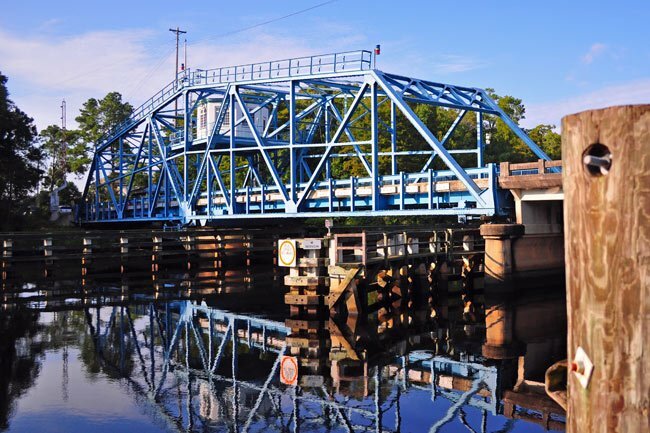 The Socastee Historic District, comprised of a metal swing bridge that crosses the Intracoastal Waterway, two houses, one store, and a pecan grove, represents the early twentieth century creation of the community of Socastee. It has local significance as an intact example of the development of communities in the upper coastal region surrounding the newly emergent small commercial enterprises in the decades following the Civil War. The community came into being in the 1870s and 1880s; its current form shows to what it had evolved by 1935. This is one of the few intact examples of such communities, with a store and surrounding houses, in Lowcountry South Carolina that has not had significant intrusions or alterations. The district contains particularly good examples of three types of vernacular architecture which were prevalent in the late nineteenth and early twentieth centuries in South Carolina: a modified weatherboard-clad I-House built in 1908, a massed-plan side gabled weatherboard-clad house built in 1881, and a front gable frame commercial building built in 1905. 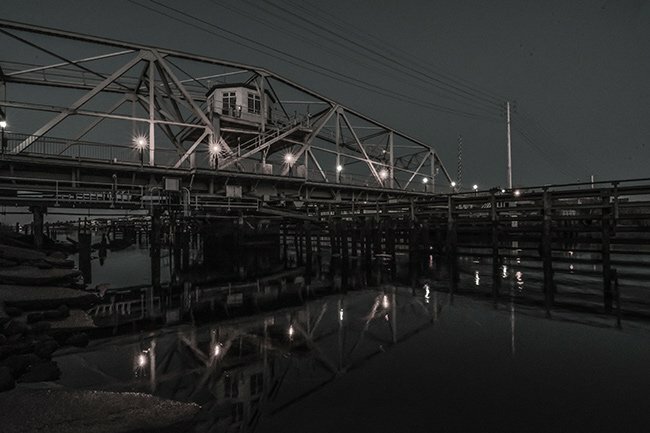 The bridge is a swing-span, Warren through-truss type bridge with rigid joints which when completed in 1935 marked the completion of the Intracoastal Waterway in South Carolina. 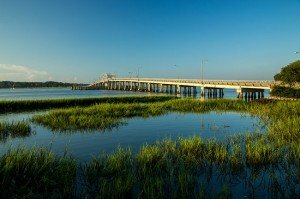 completed in 1935, and marked the completion of the Intracoastal Waterway in South Carolina. As a result, the opening celebration for the Waterway was held in Socastee in April, 1936. The bridge is in good condition and retains integrity. Love this! 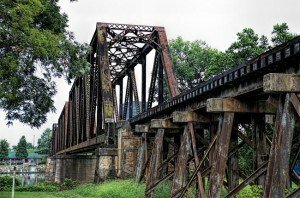 I lived in Surfside for years and we used to cross the Socastee bridge. Last account I had they had to have replacement parts made; they are not kept in stock! I hope they never do away with this! How high is the bridge for my sailboat to pass under? Thanks. Is the bridge manned during the day, or does it operate on auto pilot? If yes, how often are employees hired? 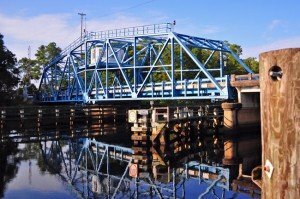 The swing bridge is still there because business and residents depend on it. Even with the overpass, there are no easy routes to many of the communities with out the swing bridge. For businesses, they would lose several of their customers if the swing bridge was taken down. With the completion of the 65 ft high bypass, why is the swing bridge still there? The waterways used to be the easiest way to transport commerce goods. It is written in the 1783 Paris peace Treaty that the Mississippi was to be forever free to open travel to the British as well as the United States. The waterways are considered first Right of way's and are regulated under the Coast Guard, and protected under Federal laws. The concept is that the water way existed before the bridge, therefore they cannot change priority of Right away for something that came later. For the most part most bridges have certain time restrictions as to when they can close. 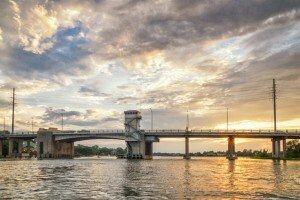 Usually after 10:00 pm bridges stay open. We are sorry for your frustration with the bridge. 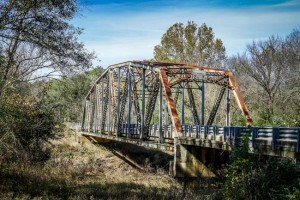 Just to clear up any confusion, we are not connected with the bridge or the state in any way; we simply operate a private website that documents South Carolina landmarks. Best of luck with your commute – we have a similar situation here in Charleston and completely understand! So this is ongoing issue with us locals who choose to use the swing bridge route to gain easy access to 70. As always you leave home at a decent time to beat traffic and still get hold up waiting on that bridge, always (15 or more min). We often have to wait for a drawbridge to get to and from our SCIWAY office – we can commiserate! On the other hand, it is special part of life on the coast of South Carolina, and we never mind too much. I understand that the waterway existed before the bridge and I would understand that to be the case for commercial boats but I sat in the line for over 20 minutes just for the bridge to switch for one boat and then literally 3 minutes later switch again for 3 more boats – this causes a lot of delays not only with work but with getting children to school! Yes, feel free to share this link on your page! Very informative! Can we share it on our page? Thank you! The Federal regulation follows the logic that the waterway existed before the bridge. This is true of all moveable bridges, though some moveable bridges in large cities are closed during high-traffic hours, usually during the morning and afternoon rush. Why do the boats have the right of way at the swing bridge? Are you opening today 4/16 with the wind forecast?